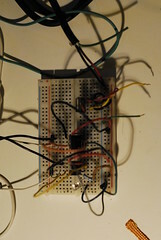 Another exciting Intro to Electronics workshop is coming up in a week. It’s perfect both for total beginners as well as those who need an electronics refresher. We will be going over the basics needed to understand how a circuit operates at its simplest level. We’ll be covering voltage vs. current, resistors, capacitors, microcontrollers. Through a series of quick LED projects the workshop teaches the use of these elements as well as how to build circuits from schematic drawings and troubleshoot them. The workshop will equip you with the basics to develop your own, much more complex and fun electronics systems. The possibilities for awesomeness are infinite! !